I've been kind of quiet on the blog lately because I've been struggling with figuring out how to be a working mom when my job doesn't fit within the 9-5 hours and I'm not busy enough to feel that productive when I am in the office. Husband has been traveling too much so I've had to put the kabosh on it - one AM/PM per week is all he can be gone. I don't have much of a choice - I need to be very available for my job and since I make a significantly higher salary than his job does my job has to come first. But when I spend all day doing nothing and then have to take a call at 5:30 pm it is very frustrating. On the kids front: Penny has started puking up some of her meals - I guess we were too quick to think she doesn't have acid reflux. We are being careful not to "overfeed" her (whoever said you can't overfeed a kid doesn't know Penny's love of "gruel") and will call the GI on Monday. Ned loves to roll from his tummy to his back but can't roll the other way so we have created a vicious-Weissbluth* disapproved cylce where I have to go in multiple times a night to flip him back on to his tummy. Oh, and 6 am is the new 7 am for the kids. On the fun side Ned started saying "b-uh" or "b-ah" - definitely a "b" sound. And Penny has started with the "gee" noise. Since Penny has adopted some of Ned's noises I sometimes have to look to be sure which kid is "talking". This weekend the weather was great and I came out of hibernation to visit with some work friends - Cynthia and her daughter who hosted our play group, Chris and her daughter and ABS who took some awesome photos all joined in the fun. 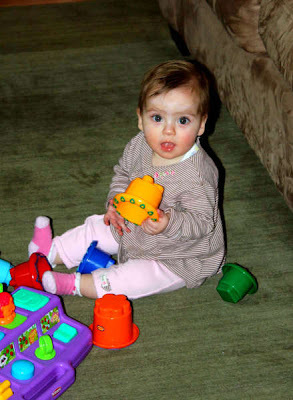 I did a good job not stressing how "far" behind my kids were (Chris's daughter is as precocious as little Georgie with her crawling) but her toy set up gave me some ideas so I may have to pick up the stacking cups Penny is playing with and a baby doll that Cynthia's daughter loves. The most important part of the outing was the swings. I have been dying to do a twin back-to-back shot. It was beginning to sprinkle when we left for the park but I was determined. Penny loved, loved, loved the swing - squealing in delight. I'm going to scope out the parks near my house to see if I can find another infant swing. *Weissbluth is coming out with a book on twins this summer. Check it out! Very cute photos! The duchess tried the swings on Memorial Drive on Friday and was well pleased. Weissbluth would be shocked at what I do every night to get Georgie to sleep! (And now, nap). See you soon! 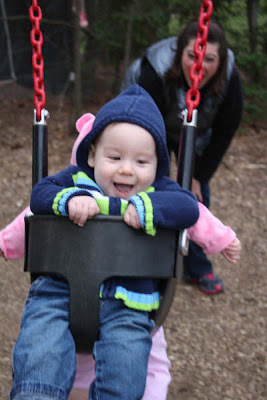 There are some great playgrounds around us---the one in Stoneham center has baby swings I think, so does the tot lot in Reading, the park by the lake and Hunt Memorial Park in Reading (my new favorite!). I'm so sad I missed it -- it looks like you guys had a ton of fun :) And when did Penny get all that hair??? I feel for you on the work front...I did it and still am doing it but I wish I could be more positive like Nancy. You will get it, I agree but my heart has always been home. I have teenagers and I still want to be home....sigh. However, here in Michigan and it sounds to be everywhere now, you don't complain when your working :( But, I am a legal secretary and I'm BORED. I'm thankful I still get a paycheck because who knows for how long but my attorneys are way slower than usual. Good luck. 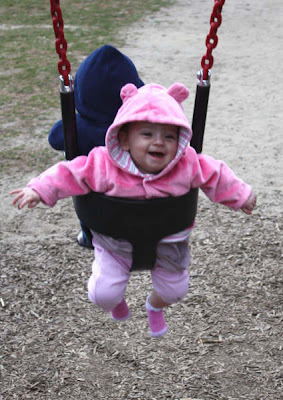 Your kids are adorable and I love the twin swing photos. I scoped out the swing I'm going to take them to first on a walk through Dot Park this past weekend. Glad you posted this...it's a reminder to me to try to get this picture! Thanks! Penny's pink coat is the cutest thing ever! Love it.